From my (very) limited knowledge of the NCAA Diving qualifying criteria (or anything related to diving, that is lol), it would appear that Connor has made the cut for this event, as the top 7 in the 3m springboard for Zone E do get invited!!! Congrats!!! Well Johnny Robinson placed 7th in finals of the Platform today, so I believe he's in, along with Connor Callahan (3m) - 2 Bears qualifying for 2018 NCAAs in diving, yay! Though they can't match national rival Texas's three NCAA qualifying divers, the California men will have two competing in Minneapolis, with Jonathan Robinson scoring the last qualifying spot in Zone E on the final night. Robinson joins Connor Callahan on the Cal NCAA team, bringing them right up to their roster cap of 18. Stanford's Theodore Miclau won platform on a great night for the Cardinal men. Tarek Abdelghany was fourth and those two will represent Stanford at NCAAs. Looks like the Bears will send a full team to the NCAA 'ship, 18 people. What a bonanza! Congrats to the swimming & diving team! Go Bears! We ultimately rolled with Texas, in part because of the return of John Shebat and in part because of a big diving boost coming out of Zones. This year, these rankings are not reliable. Only the Bears themselves know how well they're doing as do the Horns. The 200 IM event should give some ideas how Cal is doing. Cal might be able to eliminate Horns' diving advantage with just this one event even though all 3 Texas divers are probably scorers. BERKELEY On a Wednesday afternoon in Berkeley, about 10 or 15 minutes after the rest of the Cal men's swimming team has left the pool and hit the showers, Nick Silverthorn and Zach Stevensare still in the water. They work under the watchful eye of legendary Cal head coach emeritus Nort Thornton, toiling those few extra minutes to hone breaststroke technique or work on their start off the block. That final group will eventually leave the pool, change clothes and head off to class and both Stevens and Silverthorn will merge with the rest of the Cal community as students at the No. 1 public university in the world. In the literal sense, those moments are becoming fewer and fewer as both near the end of their collegiate careers. 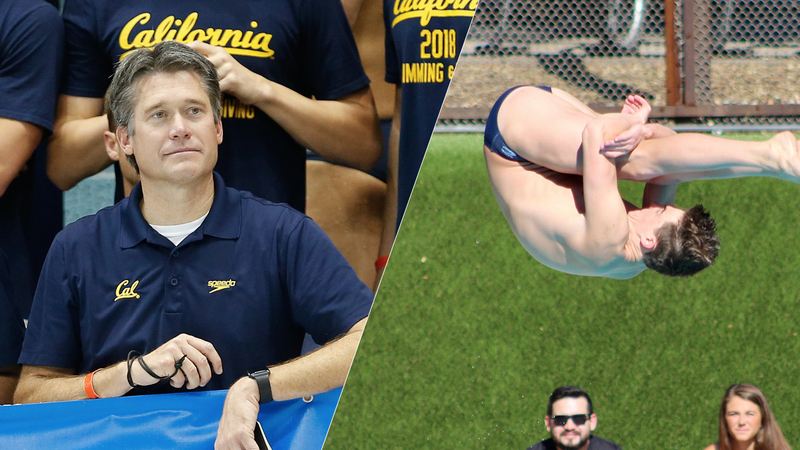 Neither will compete at the NCAA Championships, which means both Stevens and Silverthorn donned their Cal cap for the final time in college competition at the recently concluded Pac-12 Championships. And, when 19 Golden Bears 17 swimmers and two divers line up to compete in Minneapolis with a national title hanging in the balance, those two senior leaders won't be included in the thoughts of the website writers and psych sheet number crunchers. But ask anyone wearing blue and gold at the Jean K. Freeman Aquatic Center what Zach Stevens and Nick Silverthorn mean to the 2018 Cal men's swimming and diving team. Watch as their faces light up in telling the untold stories, some that might even include theories on what goes into making a quality salad, of what has put this group of Golden Bears in position to be successful on the national stage. In that conversation, the contributions offered by Cal's duo of senior leaders mean more than any time or trophy ever could. 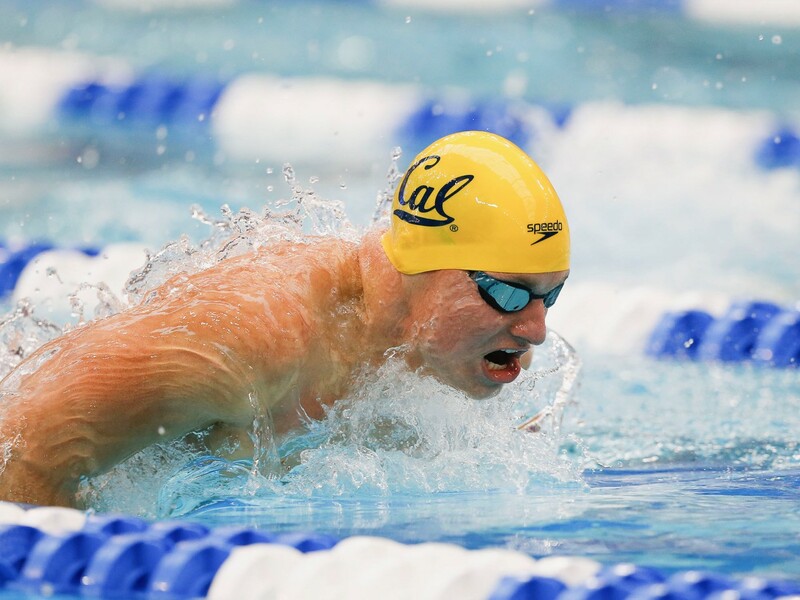 Entering their final season as collegiate swimmers, Stevens and Silverthorn looked to provide leadership for another talented group in Berkeley. Of course, both eyed making it onto the roster for the NCAA Championships as the perfect way of finishing their careers. As counterintuitive as it may seem in an individual sport like swimming, those individual goals came second in many respects. Both Stevens and Silverthorn wanted to impact the group as a whole, and when they sat down to map out a plan for their final season in Berkeley, each was confronted with an opportunity to leave a lasting mark on the program. For Stevens, that chance came in the classroom. A standout student himself, the native of Arroyo Grande, Calif. was challenged by head coach David Durden and associate head coach Yuri Suguiyama to bring the team together when it came to a collective effort in the classroom. "At the beginning of the season, I sat down with Yuri and we talked over some ideas on what has and hasn't worked in past years," Stevens said. "I had three years to bank off and Yuri has plenty more to bank off for what does and doesn't work. We just put together a plan as far as getting the team to work on school together like we work on swimming together. I think that made the biggest difference, studying together, doing a lot of academic work together outside of the water." The plan consisted of regular study sessions, whether in the Haas Pavilion Club Room or the team room at Legends Aquatic Center, in which the team would come together in an effort to focus on academics. Relying on each other for accountability when it came to studying mirrored the approach the Bears take in the pool. It worked. The Bears compiled a 3.11 team grade point average for the fall semester, earning the distinction of Scholar All-American team from the College Swimming and Diving Coaches Association of America (CSCAA). 10 athletes finished the semester with a cumulative GPA of 3.0 or higher. "To me what it says about Zach as a young man is his maturity goes well beyond his years," Durden said. "To be a college senior and student-athlete and understand that I can impact this team and it's athletic performance by handling this particular not very fun, not very glamorous task, it's something that's not going to be talked about on a website or written about after a dual meet and something that's not going to be really shared with my other student-athletes but this is the impact I'm making on this team. That shows a lot of maturity." As Stevens championed the academic piece of the puzzle, Silverthorn worked to lead the Bears in other ways. A vocal leader ever since his club swimming days, the Livermore, Calif. native marshaled Cal's forces when it came to the little things that help a team come together. In Silverthorn's case, that meant a discussion with Durden, Suguiyama and the rest of the senior class to list out the minor details that could make a big difference in March. In the same way that Stevens called on the entire group to work together academically, Silverthorn did the same with the minutia that can often cause members of a team to fend for themselves. "A lot of it was the principle of doing everything together," Silverthorn said. "It doesn't take 32 guys to set up the pool but it takes 32 guys to win a national championship. So, let's all show up 15 minutes before practice, make sure everything's ready to go and we'll be ready to go together. Really simple things like that have helped us since day one. We've all been working on this thing together." In an individual sense, Silverthorn enters the final week of his collegiate career as the odd man out in one key respect. Short of an NCAA qualifying spot by a mere six-hundreths of a second, it would be understandable if he wanted to put a little distance between himself and the pool. Instead, he has focused his energy in the opposite direction. Silverthorn will travel to Minneapolis to be with his team and do whatever he can to help the Bears have success. In 2017, that meant stretching suits and mixing more energy drinks than he could count. He'll do the same again this year and calls it the "most important week" of his Cal career. "It should be a model for how you move through your career here in our swimming and diving program," Durden said. "Your impact on this team is not just through your performance of going back and forth in the pool but your impact on this team is greater than that. That's clich to say, but I think with Nick, it's not only his impact on this team right now but the impact he's made on our culture that will last beyond his time here. That is what will be so impressive. The things he put in place, the expectations he had on his teammates in terms of how they act and behave are just phenomenal." As both Stevens and Silverthorn wind their careers down, they'll share equally in the nerves that come with the final meet of the year. Stevens will watch from Berkeley, Silverthorn will be with the team and both seniors will take immense pride in the accomplishments of the 19 Bears competing in Minnesota. "Some college student-athletes are the look at me, I'm filling it up for 35 points from the field or scoring six touchdowns or I'm going an American record time in the pool. That gets lauded and appreciated and put on a pedestal as the reason a team is successful because this athlete had this athletic performance and the team rose to that level," Durden said. "For us, it doesn't necessarily work that way. For us, taking care of things that aren't getting written about, things that aren't being applauded or put on a pedestal, is really a key piece to our success as a program. Frankly, we can get away from that. What makes us Cal and what makes us good is the absolute collective and everybody understanding their role and their piece that they can put into this." Cal scored the most swimming points with 437.5 followed by NC State with 385, Texas with 368, and Florida with 347. Indiana led the diving points with 98, followed by Texas with 81, Tennessee with 56, and Purdue with 54. USA Swimming Foundation: Check out a few photos from the National Team Alumni Social at the Men's DI NCAA Championships, especially the one with Rowdy, Steve and Nathan: three NCAA Champs in the 100 free - all of whom were blown out of the water by @caelebdressel last weekend! 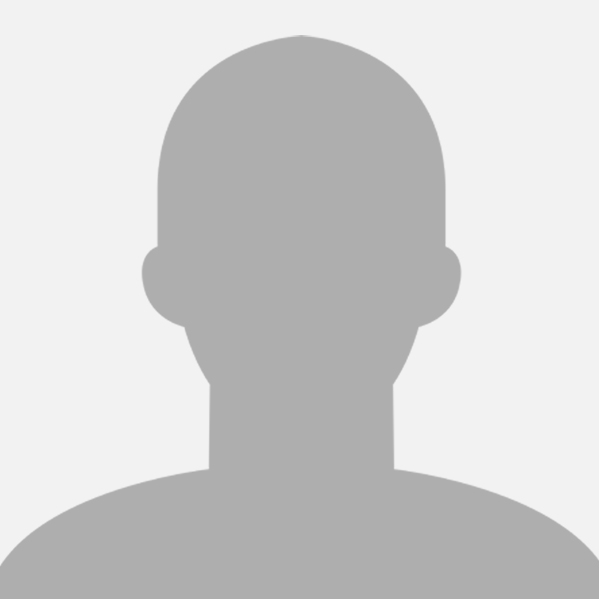 WHO RETURNS THE MOST POINTS FOR 2019 MEN'S NCAA'S? The best metric for projecting a team's success the next season without looking at recruiting classes is returning individual points. Based on returning points from the actual meet Texas has the most returning points with 251. Cal are next with 218.5 followed by Indiana with 180. Basic returning points numbers were already covered in my original scoring wrap up post, but those don't paint a full picture. Some events like the 50 free where 8 seniors scored will look very different next year. Other events such as the 100 back where 2 seniors scored have the potential to look very similar next year. We can account for this by re scoring the meet with the seniors removed and seeing who has the most returning points. This method ignores all of the new freshmen that will fill in some of the gaps next year, but freshmen score a smaller share of points at this meet than upperclassmen. Adding freshmen isn't a direct replacement for subtracting seniors, so there is should be some merit to this methodology. In the re scored-without-seniors format, Cal have the most returning points with 337.5 no seniors points. Texas have next most with 300.5 followed by Indiana with 212.5. Cal's jump up the ranking is a product of their abundance of bottom of finals/top of consoles type swims or guys just outside the top 16. This left a lot of room to move up. For example, in the 100 fly, 8 of the top 11 guys were seniors. Removing them leaves Cal with the #2 returner Ryan Hoffer (6th this year) and the #4 returner Zeng Quah (12th this year). Texas on the other hand had a lot of guys already very near the top of their events who can't improve by many points (ex Townley Haas, Jordan Windle, John Shebat), or guys ranked so far down in their event that removing all the seniors still doesn't bump them into the scoring (ex. Chris Yeager, Parker Neri). This isn't to say that Cal is a clear favorite headed into next year. Recruiting classes will role in determining who is the favorite next year and Texas has a pretty good class coming in. However, the idea that Texas is already returning the most isn't clearly true. With Cal still fighting for NCAA titles all four years of this class, it's a bit jarring to see how their top-tier recruits didn't pan out. #4 Silverthorn didn't improve much and never made NCAAs individually. #3 Gornay went backwards his freshman year, then dropped off the roster. Honorable mention Kao was a two-time NCAA qualifier but never scored, though he was a big Pac-12 contributor. Justin Lynch was solid, though, scoring in three of his four years. Cal had to supplement its class with big scoring from unranked Connor Hoppe, but still didn't get nearly as much out of this class as it could have. The top of this class was rough for Cal, with Gornay dropping off the roster early and Silverthorn and Kao never scoring NCAA points. Lynch was a solid three-year scorer and Hoppe became one of the class's best with three years of scoring himself. The far left column tracks their individual ranking in our top 20 recruits post. HM means "honorable mention," or those ranked between #11 and #20. UNR means "unranked" and INTL means "international", as we don't rank international swimmers in our top 20 post. 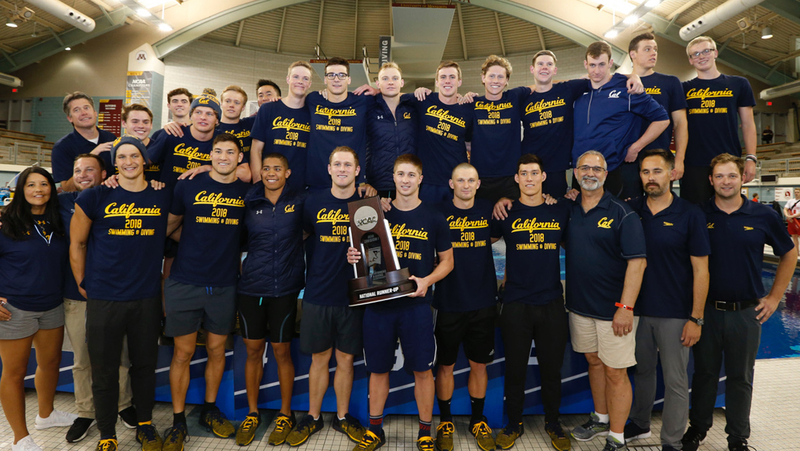 BERKELEY - Another tremendous season by the Cal men's swimming team yielded a pair of postseason awards from the Pac-12 as David Durden was honored as Coach of the Year and Johnny Robinson was chosen as Diving Newcomer of the Year in a vote of conference coaches. 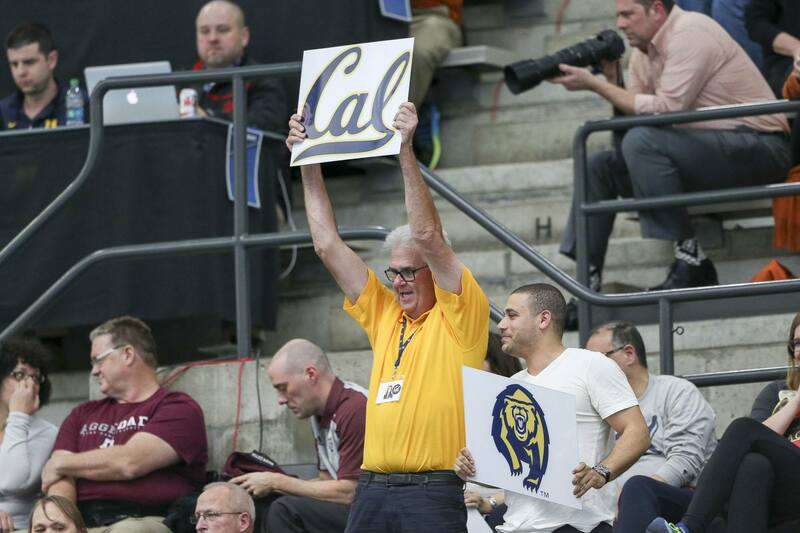 Durden earned the title of conference's top coach for the seventh time in his 11 seasons at Cal just days after another impressive showing by the Bears on the national stage. 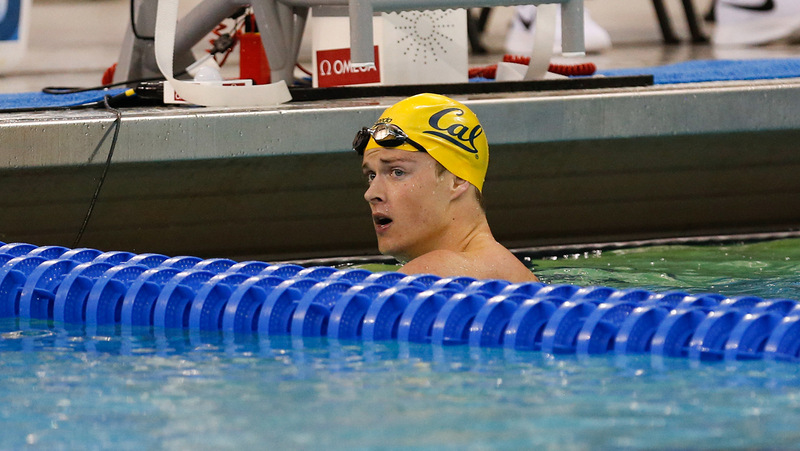 Gettiing better and better as the meet went along, Cal gave itself a chance at swimming for a national title with a thrilling final session on Saturday night in Minneapolis. The Bears battled Texas to the closest team race (11.5 points) since 2002 and continued to show the all-around depth and strength of a program that competes for the team title every year. Cal's impressive season goes far beyond what happened at the end of the year and certainly isn't confined to what happened in the pool. From a competition perspective, the Bears captured the fifth Pac-12 team championship in program history with a dominant showing in Federal Way, Wash.
Outside of the pool, the Bears also enjoyed one of their most successful academic seasons as they were named a CSCAA Scholar All-America team with a team GPA of 3.11 in the fall semester. By the end of the season, 10 Golden Bears went on to earn Pac-12 All-Academic honors. Robinson becomes just the second Cal diver since 2000 to earn newcomer of the year status, joining Javier Rivas, who won the award in 2005. A native of Irvine, Calif., Robinson qualified for the NCAA Championships on the Platform and joined Connor Callahan as Cal's diving representatives in Minneapolis. The trip to NCAAs put a cap on a standout freshman campaign for Robinson, who held the second-highest point total of all four of Cal's divers on all three boards. He qualified for the Zone E Championships on both the 3-meter and platform, recording a season-high point total of 339.00 on the 3-meter and 320.35 on the platform. Cal men's head coach Dave Durden tells SwimSwam that this policy change shouldn't impact their team. According to him, recruiting classes are traditionally comprised of 6-8 athletes, meaning they typically field a team of 24-32 - below roster management numbers. USA Swimming Stats: Opportunity - These are the top 25 (U.S.) Performers in 2017-28 200y Fly. Now that the long course season has started let's see what happens this summer. USA Swimming Stats: In the hunt - These are the top 25 (U.S.) Performers in 2017-28 100y Fly. The focus is now long course meters. A big summer of swimming ahead. 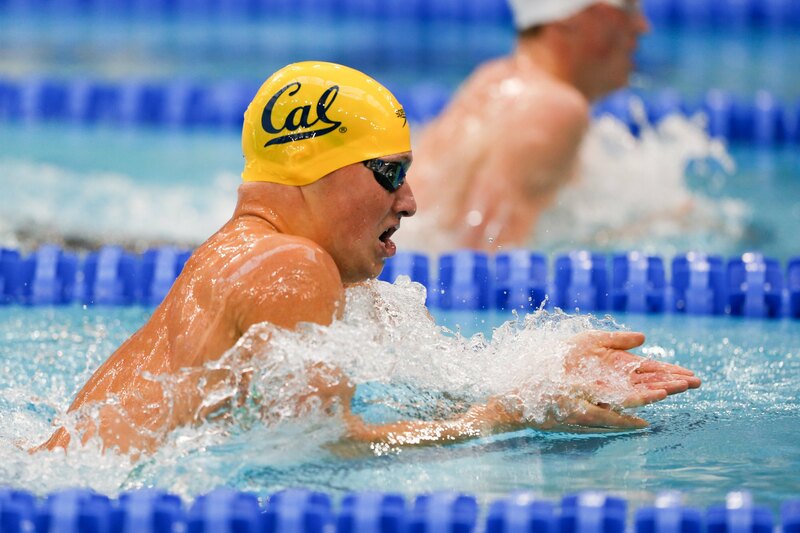 BERKELEY - A tremendous season of academic achievement continues to pay dividends in the form of awards for the Cal men's swimming and diving team as six Golden Bears have been named Scholar All-Americans by the College Swimming and Diving Coaches Association of America (CSCAA). To earn Scholar All-America first team status, a student-athlete had to compete at the NCAA Championships and carry a grade point average of 3.50 during the 2017-18 season. Student-athletes who had a GPA of 3.50 or higher and recorded a NCAA "B" time standard earned Scholar All-America honorable mention. Freshman Daniel Carr and sophomore Pawel Sendyk led the way for the Bears, each earning first team honors after a season in which they each made a big impact both in and out of the pool. Carr swam the leadoff leg on a 200-yard medley relay team that set an American record and scored 13 individual points by making the night session in both the 100 and 200 back. Sendyk earned a pair of All-America honors himself, taking fourth in the 50 free and competing on Cal's 200 free relay team. Four more Golden Bears earned honorable mention with Nate Biondi, James Daugherty, Jarod Hatch and Zach Stevens all receiving recognition. Stevens made a measurable mark as Cal's team leader when it came to academics, helping set a tone throughout the year that resulted in the Bears receiving Scholar All-America team honors both semesters. And, Cal looks to be in good shape to continue those efforts with Biondi, Daugherty and Hatch all earning recognition in their freshman seasons.